As members of the North Carolina Arboretum Society, we recently learned about a new exhibit on display at the North Carolina Arboretum and we wanted to share the information with you in the event you’re looking for things to do in our area during this quiet winter season. 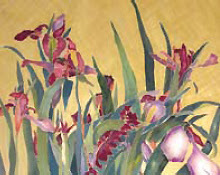 Those of you (like Brigette) who are trying to find garden-inspired activities to tide you over until Spring will enjoy seeing botanical artist Jamie Kirkell’s silk painting exhibit, “Orchids and Iris in the Garden,” on display in the Arboretum’s Education Center Second Floor Gallery, from now through April 20, 2008. The exhibit presents Mr. Kirkell’s wall tapestries and large silk floral paintings. Original paintings will be available for purchase. Mr. Kirkell draws on his education and experiences in Indonesia, the Philippines and Southeast Asia in the creation of his contemporary botanical paintings. He studied batik and textile design under Master Batik Artist, Bambang Oetoro at the Batik Research Institute of Indonesia. While in the Peace Corps, he spent time in the Philippines and Southeast Asia furthering his interest in orchid collecting and floral design. His studies have also taken him to Ohio State University and The Art Students League in New York. Mr. Kirkell has exhibited work across the US, including galleries and botanic gardens in New York City, San Diego, Miami, and Cleveland. Internationally, his works have been exhibited in Israel and Aruba. His pieces are also in the collections at the Chrysler Building in New York, the Aish Hatorah Library in Jerusalem, Devi Sri Hotels in Aruba and the Turnberry Isla Resort in Miami. An artist’s reception will take place on February 3, from 2pm to 4pm in the Arboretum’s Education Center. The reception is free to the public and does not require registration. More about the Arboretum from its website: The North Carolina Arboretum is a 434-acre public garden located within the Bent Creek Experimental Forest of the Pisgah National Forest. Surrounded by the dense folds of the botanically diverse Southern Appalachian Mountains, the Arboretum is nestled in one of the most beautiful natural garden settings in America. This entry was posted in Uncategorized and tagged art, Asheville, NC Arboretum by Inn on Mill Creek. Bookmark the permalink.